This appointment involves a thorough, structured examination of your oral health. The dentist will assess the condition of the teeth and gums as well as the surrounding tissues. Our emphasis is prevention; hence regular six monthly check-ups are encouraged. Digital x-rays are taken routinely at your first visit and when appropriate thereafter. If any treatment is found to be required, the dentist will discuss the options and provide a breakdown of the plan. Laurel Villa has always welcomed children of all ages. It is important that children develop confidence at the dentist and avoid fear. Hence we encourage routine checkups from an early age. We can monitor development and assist with maintenance and prevention using fluoride application and fissure sealants. Fillings can be provided on the NHS as well as extractions if required. Referral for orthodontics will be made when appropriate. The age range is usually between 10 and 13. 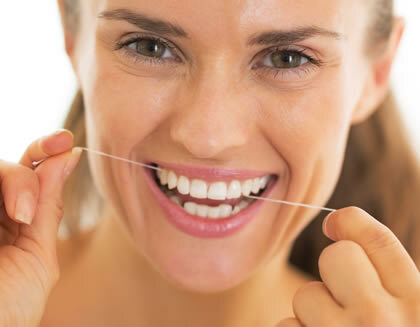 Most people suffer form some type of gum disease. This can range from occasional bleeding to chronic bone loss, which can lead ultimately to tooth loss. In most cases however, gum health can be controlled. White filings are tooth coloured resins that can be bonded/stuck to the surfaces of both front and back teeth. Over the years many white filling systems have been developed, with varying degrees of aesthetic and wear resistant features. Current materials can look good and have long term durability. The versatility of white fillings can be applied for the repair of a chipped edge or to the reconstruction of a broken tooth. At Laurel Villa we have a range of materials to suit each case. Your dentist will explain more with regard to NHS and private options depending on the clinical requirement. Further information can be found under bonding. Still the most commonly used filling for back teeth. Amalgam is an alloy of different metals and provides excellent strength and durability. 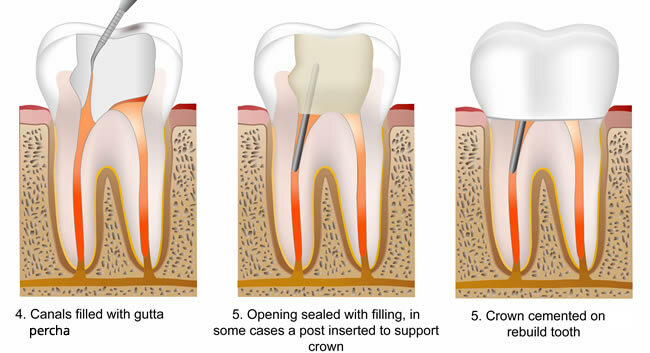 A crown provides full coverage of a broken down or weak tooth. They are often required following root canal treatment. Crowns can be made of metal alloys, porcelain with a metal lining or all ceramic. Your dentist will help you chose the most suitable crown. Inlays/Onlays provide partial coverage of a broken tooth and can also be used to restore large cavities. These restorations can be made of metal, gold, resin or porcelain. Both inlays/onlays and crowns require a preparation appointment with an impression. The restoration is made in a laboratory. 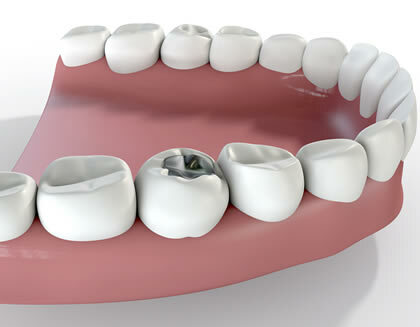 Your tooth will be temporised and the work is normally cemented 2 weeks later. 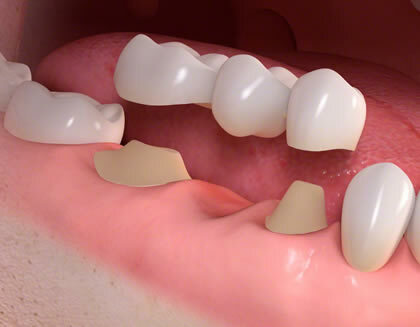 Bridges are used as a fixed method of replacing missing teeth. They are made of porcelain on a metal or a ceramic foundation. 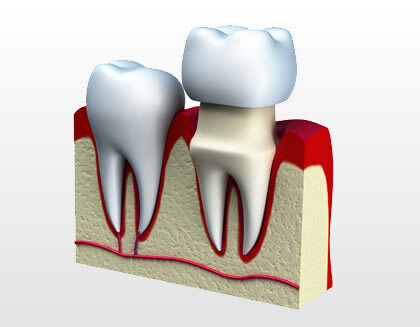 Bridges are cemented to one or both adjacent teeth around the gap. There are several types of bridge requiring greater or more minimal tooth preparation. Your dentist will explain the appropriate options. As with crowns and inlays, bridge provision requires 2 appointments - the first to prepare the teeth prior to impressions, and the second to fit. A temporary restoration will normally be provided during the 2-week manufacture time. All our teeth have what are known as root canals within them. This nerve complex allows us to feel temperature and pressure changes. If the complex is damaged by decay or trauma, toothache and possible infection can occur. 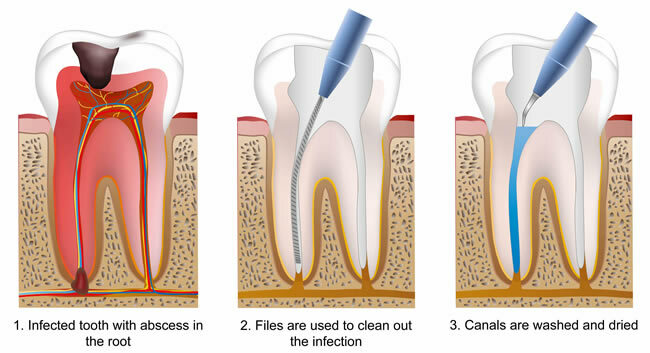 Root canal treatment involves the location, preparation and filling of these canals. The process is completed in one or two visits depending on whether the tooth is infected. X-rays are required to identify infection and your dentist can see the number of canals involved. Once finished, your dentist will help you choose the most appropriate restoration to complete the treatment. We are well equipped at the practice to offer all routine extractions. More difficult removals, such as impacted lower wisdom teeth, may require hospital referral. Certain medical conditions may also indicate extraction in a hospital setting. 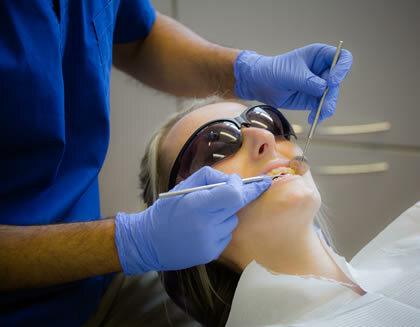 Your dentist can also arrange to refer for sedation-based treatment when required.